While an overstatement, Kansas City certainly experiences its share of all four seasons. The fluctuations in our weather can be frequent, rapid and unpredictable. 1,235,145 weather-related car crashes, which accounted for 21% of all vehicle accidents. 5,376 were killed in weather-related crashes. Given these statistics, it is important to be prepared before you head out in bad weather in and around Kansas City. In extreme weather conditions, it is always best to wait, but if you must drive here are some tips on how to avoid getting into a car accident and injuring yourself or others. Get a tune-up. You should check the air, fuel and emission filters and make sure you have fluids that resist freezing, like antifreeze, oil, and windshield-wiper solution. You should also inspect your windshield wipers and replace any that have cracked rubber. Keep an emergency kit in your car. This kit should include a blanket, road flares, a shovel, a flashlight, jumper cables, a tow rope and tire chains, an air compressor, and an ice scraper and brush. You should also consider keeping water, warm clothes and a blanket in your car. Check your tires. You can confirm if your tire treads are thick enough by inserting a penny into the tires’ grooves so that Abraham Lincoln is headfirst. If the top of the president’s head is showing, the tires should be replaced. Clean your headlights. Headlights can turn yellow and cloudy from the sun, which reduces their effectiveness. There are cleaning products you can purchase at automotive stores to eliminate this issue. Slow down. If you are driving in snow or ice, slow down. Even if you have all-wheel drive, lower your speed by 10 mph, and reduce further if that does not feel safe enough. Beware of black ice. This is one of the biggest dangers because you often don’t know it is there until it’s too late. Black ice often appears on bridges, in downtown corridors with tall buildings and at intersections with poor drainage. Each of these areas have added dangers, so again it is important to slow down and exercise caution. Don’t tailgate. 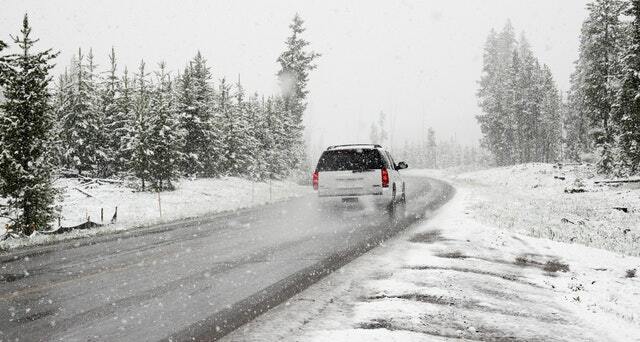 In snowy or icy weather, leave extra room between your car and the car ahead of you. On the highway, this distance should be about 100 yards, which should allow you to stop if the front car brakes suddenly. Avoid braking in a turn. Turns are especially dangerous in winter weather, so you should enter turns slowly, and coast without accelerating or strong braking motions. When you brake, the wheels freeze up and the car can spin out with the momentum and lose control. How to correct a skid. If your car begins to skid, stay calm, release the brake and accelerator, and slowly turn steering wheel into the direction of the skid. This will allow you to cancel out the skid motion and straighten the vehicle direction. Tap your brakes before entering a foggy area. This will alert cars behind you so they give you extra room. If you slam on your brakes in the thick of the fog, they may not see you at that point, and you could get rear-ended. Use your fog lights. Fog lights are typically controlled with a switch on the dashboard or on the lever that controls the turn signal. The lights are usually low to the ground to brighten the road and are often colored yellow to shine through fog better. Again, slow down. Like snow, you should slow down by 10 miles an hour. Cars can hydroplane in the rain by rising off the ground and gliding on a layer of water. If you experience a hydroplane, stay calm, reduce your speed and avoid a collision until normal driving resumes. Avoid flooded areas. When you are driving, it is impossible to gauge the depth of a flooded area. For that reason, “turnaround and don’t drown”. Your car can quickly get overwhelmed with water, and if water goes into the air-intake valve and the engine, the car will shut off. If your car is stalled or shut down in a flood, abandon it immediately and seek higher ground. Softly tap the brakes after a puddle. This creates heat and friction, which helps eliminate the moisture from the brakes and ensures they are working properly. Get to safety. Make sure you and your vehicle are safely positioned out of traffic. Pull off the road and use your hazard lights. If you have flares, you should place them behind your car to alert them. Don't wander. Do not leave your car unless you know where you are, how far it is to safety or help, and are sure you will improve your situation. Stay warm. If your car's exhaust is not blocked, you can stay warm by running the engine and heater 10 minutes every hour depending upon the amount of gas in the tank. If there is heavy snow or ice, keep at least one window open slightly so your car does not seal shut. Self-help. If you are stuck in snow, you may try to use cat litter, sand, or the car’s floor mats under your tires to gain traction. It’s always a good idea to have a shovel in your trunk to dig out wheels. Every year our Kansas City law firm helps those who have been injured in car accidents, and our hope is that these safety tips will help someone avoid a crash, an injury or worse. As always, if you have questions or want to offer feedback, please do not hesitate to contact us at 816-203-0143, or by using the form below. In the meantime, stay safe out there!